After Zong, (which introduced Pakistan's first Pocket TV in March, 2011) Now Telenor Pakistan introduces Pocket TV service to offer live TV on Mobile Phones. Telenor Pocket TV is initially offering 18 live Pakistani TV channels including sports, news and entertainment channels. Free for Telenor Internet users, TV channels consumes MBs from data plan. On Day Subscription for Rs. 10 with TV access on Wi-Fi access. Pay as you watch for 20 paisa per MB. 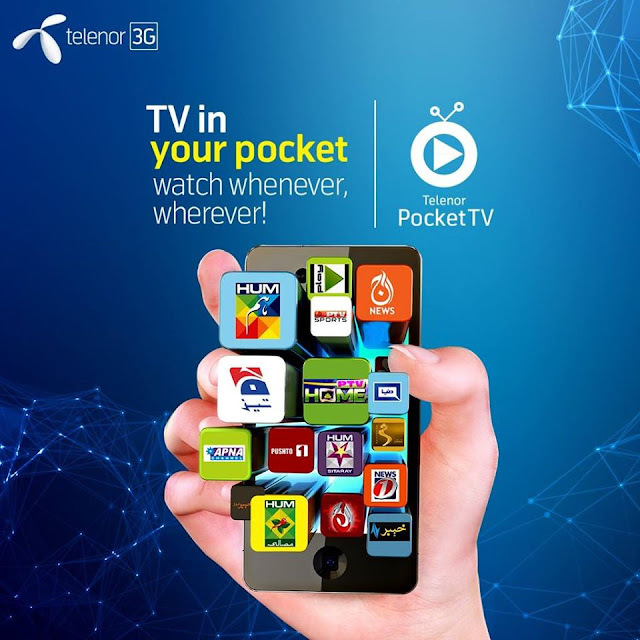 Telenor's Pocket TV service also offers Free Videos and VOD service. The service is available for Telenor 3G, Telenor Prepaid and Postpaid customers.